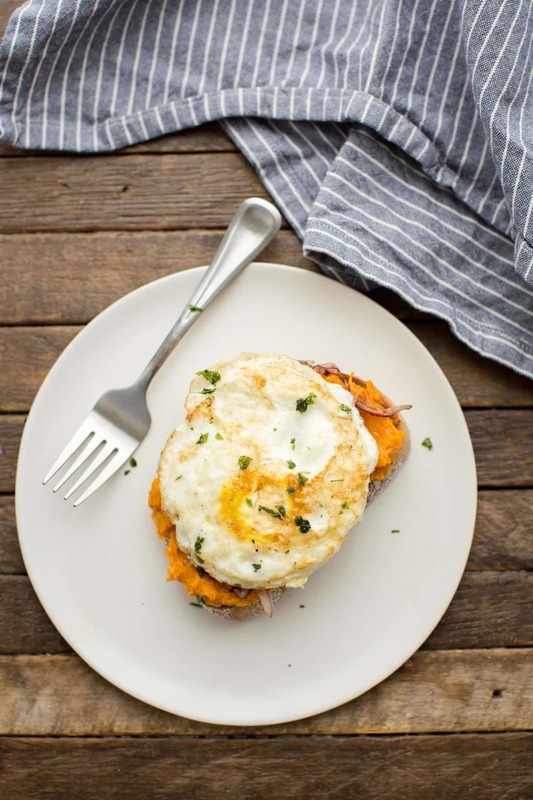 Butternut Squash Toast with Fried Eggs | Naturally. I’ve found that cooking for one can be an art form. It’s easy to make a big meal and have leftovers for a few days. Sometimes though, I just want one meal. For me, these meals happen at lunch or when I’m hungry before M gets home. I’ve learned a great deal about cooking for one. 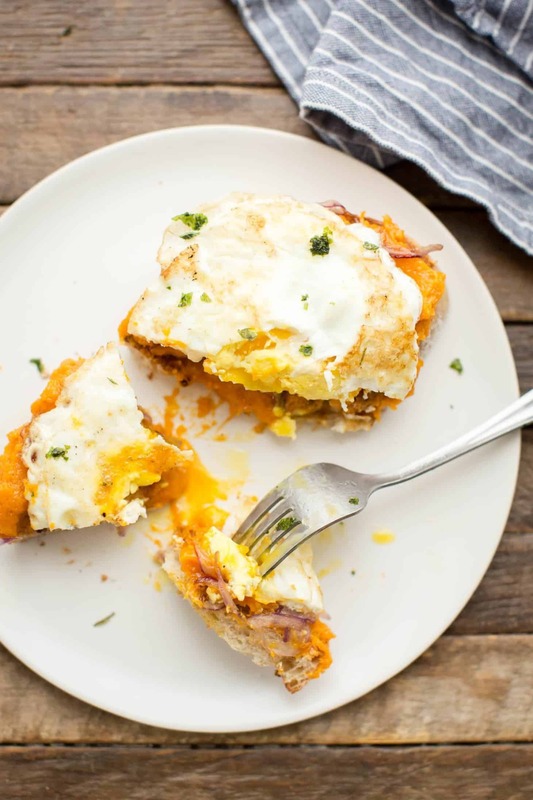 This toast butternut squash toast is the perfect meal for me. 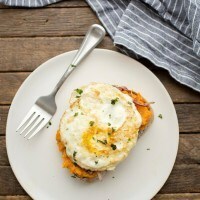 The toast provides a steady base for a creamy butternut squash puree that’s then topped with onions, a fried egg, and a small sprinkle of fried sage. Bonus, you can use the butternut squash puree in soups, sauces, or try your hand at butternut squash filled ravioli. In a small bowl, whip together the butternut squash puree, salt, pepper, and 1/2 tablespoon of butter. This works best with squash puree that is warm but you can reheat the puree or melt the butter if working with precooked puree. In a large frying pan, heat the remaining tablespoon of butter. Try and use a frying pan large enough to accommodate the onions, eggs, and sage. Add the onions, sautéing for 2 to 3 minutes. Push the onions to one side, still allowing to cook, while cracking the egg onto the skillet. Cook egg and onions together until onions are soft and egg is cooked to your liking. Place sage on skillet, adding a touch more butter or olive oil, to fry the sage for 3 to 4 seconds (depending on how hot your skillet is). Remove and place on a paper towel. Assemble your toast by smearing the butternut squash mixture over the toast. Sprinkle with onions, add the fried egg, and crush the fried sage on top. Sprinkle with salt and pepper if desired. + If needing to make squash puree, I prefer to cut a butternut squash in half, remove the seeds, and place both halves cut-side down in a roasting pan filled with 1/8″ of water. Bake at 400˚ until squash is tender (time will vary depending on the size). Vegan: Part of the appeal of this toast is the runny egg but you could swap out the egg for something like this baked tofu with mushroom gravy (and of course, swap out the butter for olive oil). Sweet Potato: Swap out the butternut squash for sweet potato puree or any other type of squash puree. Sage: Love sage? Try infusing olive oil with fresh sage and drizzling it on top of the toast. This looks really good. I can’t wait to try this. This looks so delicious! I love the use of butternut squash! Mmm! If I were feeling saucy, a little goat cheese would be divine. The most genius thing about this recipe is the fried sage. I want to sprinkle that on everything! This was such a tasty, easy dinner. Thanks! wonderful combination. Could eat this everyday!